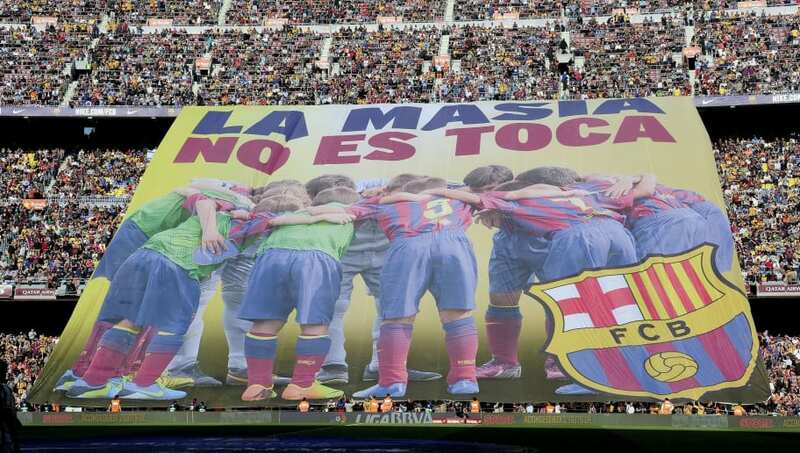 Have Barcelona Sacrificed Their World Famous La Masia Academy for Short Term Success? Originally displayed as a protest towards FIFA's decision to give the Blaugrana a transfer ban for illegally signing players, the sentiment behind it could ironically be linked to the club's current situation. Since this statement of defiance, only one academy graduate has managed to secure a permanent place in Barcelona's starting eleven with ​Sergi Roberto establishing himself as the club's first choice right back following Dani Alves' departure to Juventus. When ​Barcelona completed one of the greatest Champions League comebacks of all time against PSG in 2017, the clinching goal from Roberto was celebrated with an exuberance rarely seen at the Camp Nou. For the clubs Cules, the Masia graduate's classy strike symbolised much more than a goal to send them through to yet another European quarter final. In a team full of stars purchased for premium prices such as ​Neymar and ​Luis Suarez, it was one of their own who had made history, a player who they could relate to as he was living their dream of representing the Blaugrana on the biggest of occasions. Yet nearly two years on from that remarkable night, Roberto remains the club's most recent academy success with fellow graduates Sergi Samper and Rafinha failing to make a lasting impression for manager Ernesto Valverde. Last season saw the club respond to the sudden £198m departure of ​Neymar to PSG by spending extortionate amounts of money on Ousmane Dembele (£135.5m) from Borussia Dortmund and Phillipe Coutinho (£105m) from ​Liverpool. Neither player has come close to justifying their fees with both only showing glimpses of their undeniable talent. Coutinho in particular has been lambasted by the Catalan press this season for his poor form with many supporters questioning just why their club didn't just focus on developing some of the youth academy's brightest prospects instead. The summer arrivals of ​Arturo Vidal, Arthur, Malcom and Clement Lenglet have had a mixed impact on the club's fortunes yet Barcelona once again are leading La Liga and have comfortably progressed into the last sixteen of the Champions League. By making these signings, the message sent to the Blaugrana's youth players is incredibly alarming as their goal of representing the club grows ever harder. Even Barcelona's greatest prospects such as midfielder Carles Alena have been shunted in favour of statement transfers ordered by president Josep Bartomeu, who is a figure that divides opinion amongst shareholders at the Camp Nou. Once tipped to be the heart of the first team's midfield for years to come, Alena's only appearances for the club have come primarily as a substitute as Valverde is unwilling to put his faith in the youngster. Rumours circling that the Blaugrana could be about to sign Ajax starlet Frenkie de Jong will certainly do nothing to help the 21-year-old's quest to become a regular first team starter and could even cast a doubt over the youngster's future. Unfortunately the promising playmaker is far from the only example of Barcelona's recent disregard for their academy graduates as striker Munir El Haddadi was also given limited chances to establish himself as part of a traditional front three. The 23-year-old's immense frustration of only being a sporadic member of the squad drove him to seek an alternative future at Sevilla, joining the Los Rojiblancos on Saturday for just £1m and becoming yet another member of La Masia to fail to make a lasting impact for the club. As of January 2019, only four members of their typical starting eleven graduated from the club's world famous academy with three of those (​Lionel Messi, Sergio Busquets and ​Gerard Pique) entering the latter stages of their career. Whereas this generational talent will be undoubtedly tough to replace and in the case of Messi almost impossible, there are still a host of promising young talent coming through the ranks at La Masia. Creative midfielder Riqui Puig caught the attention of supporters when he impressed on the club's pre-season tour whilst Oriol Busquets and Abel Ruiz have both stood out for Barcelona B during this year's campaign. Yet given the current situation at Barcelona, if one of the three eventually find their way into the starting eleven in Catalunya, it would be somewhat of a miracle. In what was a club that was once championed for their promotion of the youth, Barcelona have transformed in recent years into something that the majority of their supporters despise, a 'Galactico'-style team who rely solely on expensive transfer after expensive transfer. Indeed in this modern era it is irresponsible to think that you can achieve long term success through not spending money yet in the case of the Catalan giants, a limit was set during the tenure's of Frank Rijkaard and Pep Guardiola who got the best out of the local talent. The height of Barcelona's success was their 3-1 Champions League Final victory over ​Manchester United in 2011 which was built on the foundations of La Masia with seven out of the starting eleven coming through its system. A golden generation of players that included the imperial Carles Puyol and the mercurial figures of Xavi and Iniesta, brought a pride to their supporters that the current side with its numerous imports from around the world will probably never reproduce. With the club already five points clear at the top of La Liga, a 26th title could well be on its way but when the likes of Busquets, Roberto and Pique either retire or leave, who will be there to represent the people of Catalunya? The board at Barcelona are playing a dangerous game by continuously selling their best Masia graduates and could pay a long-term price if they continue to ignore a youth academy that helped produce what has arguably been the club's best era of football in their 119-year history.